[pacman] Designed by Toru Iwantani. Programmed by Hideyuki Mokajima and crew Pacman was conceived at lunchtime...literally. The designer was very hungry, and ordered a whole pizza for himself. He took one slice, and Pacman was born. The name Pacman is derived from the Japanese slang word "paku-paku", which means "to eat". 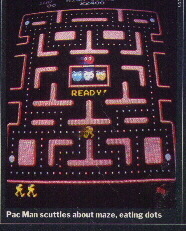 The game was called "Puckman" in Japan, but due to American's predilection with changing words to vulgarities by scratching part of the word off (Puck to..well, you know), it was changed to Pacman. To give the game some tension, some clever AI was programmed into the game. The ghosts would group up, attack the player, then disperse. Each ghost had its own AI. Blinky chases Pacman, Pinky is positioned a few dots in front of Pacman's mouth. The others move randomly. The game took 1 1/2 years to complete, and had five people on its team. Pacman is the greatest selling arcade game of all time, and is arguably the most well-known video character. It had its own cartoon, lunch box, board game, and hundreds of other products. Pacman was also the first game to have a "character", and changed the face of video games forever. Pacman was the first video game to be as equally popular to women as it was with men. (Thanks to Jeff Mercer for the Iwatani interview transcript, from which most of this trivia was taken.) 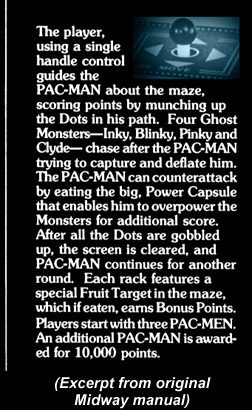 The official Pac-Man description. Wanna play Pac-Man right away ? Remember to have the macromedia plug-in installed ! Haven't heard the Pac-Man fever song yet ? NB! This song and lyrics are the properties of Buckner/Garcia. This is the original NAMCO(tm) ghost characters. Notice the japanese names and their relative nicknames. Both the color and the graphics differs from the US ones.These four cartoon-like figures all had their own independent personality. Bally/Midway had their own names based on a translation of the japanese original. 'Character' indicates the behaviour and personality of each of the ghosts, whereas the 'nickname' says something about the ghosts outlook. Pac Man's character is difficult to explain even to the Japanese -- he is an innocent character. He hasn't been educated to discern between good and evil. He acts more like a small child than a grown-up person. Think of him as a child learning in the course of his daily activities. If some one tells him guns are evil, he would be the type to rush out and eat guns. But he would most probably eat any gun, even the pistols of policemen who need them. The cage is the ghosts home. Pac-Man have no access here ! The ghosts are always looking in their moving directions. the original graphics in Pac-man ? So, you're playing MP.3-files ? All things must come to an end ! Everyone can do this. You only got to stay alive to level 256 ! Take me Back to the main Pac-page.